Brain injury, head injury, are often preventable brain injury or head injury. In the day and age of helicopters, CT scans and neurosurgery, secondary complications, particularly those that occur a week after the original injury simply are preventable brain injury. Sadly, both Quinn’s initial injury and the secondary damage done because of bad medicine, could have been preventable brain injury. I was refereeing a kids’ ice hockey game and I don’t remember any of this. What I was told is that I was skating backwards and all of a sudden my feet were up in the air, my helmet was shot off because I didn’t have my helmet on properly. I landed on the ice. My head first and fractured my skull and luckily a fracture went into the ear tube and I was able to drain and keep the pressure from crushing the brain. When I stopped sliding, I was right in front of the bench and the coach looked at me. My eyes were gone and I wasn’t breathing, no heartbeat. I was basically dead. So, he jumped on the ice, stopped the game, tried to start my heart. Couldn’t. Another guy ran across the ice. Did start my heart after three rounds of CPR. Then I was in and out of consciousness and a complete lunatic, fighting off everybody. “Let go of me. Leave me alone. Let me get up” you know, from what they – and I don’t remember any of this. I’ve apologized to most of them. I’ve tried to because I know I had, didn’t say some nice words, but, you know, just, they had to fly me to the hospital, Tomahawk. And then I was in Delray Hospital. I don’t know if you need the name of the hospital but. February 20, 2010. It’s my second birthday. So you were not quite 40 when this happened? You just kind of fell backwards? I don’t know if I had a heart issue. I don’t know if I had a head issue and just, I mean, I’ve been skating for over 30 years. I’ve fallen a million times but I’ve gotten up a million times but the million-and-oneth time, I didn’t get up. You fell directly back on your head. You were starting to show me with your helmet before we started, what actually happened. Why don’t you show us that? The helmet doesn’t work unless it stays on the head and this is how I wore my helmet for 30 years, with the strap nice and loose. You know. You look at the NHL players, they are cool. It was never a thought, never an issue. I had never lost the helmet during play, never lost a helmet during refereeing and you know for ten years, I’ve had this helmet and this strap this loose. And because it just fell off like that, you know. I mean, that simple little amount of space almost killed me. Your body and your head were basically going through a whiplash mechanism and you fell backwards, a very sudden backwards flip and because of that the helmet came off. It’s not a vector of force you probably put the helmet through before this fall because usually you are falling forwards, or sideways? If the helmet had stayed on, the back of your head would have hit the helmet and the helmet would have hit the ice, not the back of your head (because of this it could have been a preventable brain injury)? Exactly and reduced whatever brain damages have, I’ve gone through. Brendan has taught us all a valuable lesson. 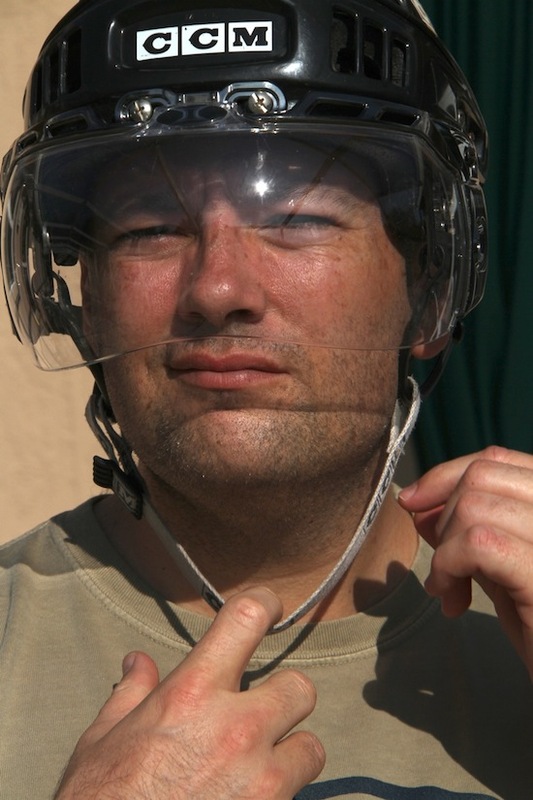 I am learning to play hockey and wear all my protection the way it was designed for my safety.That doesn’t mean that it is all comfortable or fashionable! It is a fabulous sport, but like all sports, not without the possibility of injury. 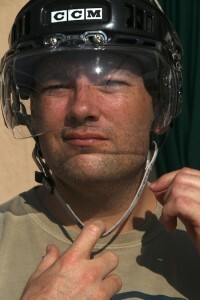 By wearing our equipment properly, we all reduce the risk of serious accidents like Brendan had. He has a cheerful spirit and is a great mentor to young and old on how to move forward with your life. He shows such respect and appreciation to his wife for her support and that is a joy to see.